Introducing astronomy novices to the hobby of stargazing requires the use of a high-quality yet easy-to-use telescope. The 216006 Polaris 130 EQ reflector beginner telescope from Meade offers the optical power that people need to see planets and stars as well as the simplistic design that makes it perfect for children and amateurs to set up and use. 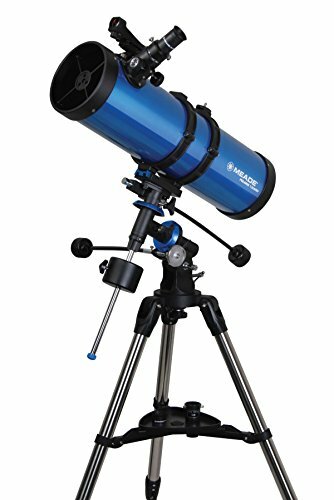 This basic telescope, priced at around $170, comes with a large yet stable German equatorial mount and slow motion controls that allow astronomy newcomers easily track planets and stars. The magnification eyepieces have low, medium, and high settings for viewing both up close and more distant objects. It also comes with a 2x Barlow lens that magnifies each individual eyepiece. Learning the basics of how to use this lightweight 37-pound beginner telescope can be accomplished by watching the enclosed instructional DVD. The telescope is designed for beginner use and measures a little over 61 inches in length. Its three different eyepiece settings allow novices to learn how to use a telescope to narrow in on celestial objects as well as keep track of them using the slide controls. While ideal for beginner use, this telescope is not recommended for stargazers who want to take their astronomy hobby to the next level. The eyepieces’ maximum strength is 6.3mm. This strength, which is suitable for beginners, is not sufficient for deeper sky viewing. Even so, its affordable price and compact design allow it to be a good choice for people who are just starting out learning about the stars and planets. It also is a good investment for parents who want to give their children a telescope that they can use in the backyard without spending a lot of money. Meade Instruments is one of the leaders in the making and selling of telescopes, binoculars, microscopes, and other viewing equipment. It is headquartered in Irvine, California and was founded in 1972 by John Diebel. It continues to perform well in the telescope industry. However, it has faced legal and financial troubles in the past. Nonetheless, it has the monetary and technology means to back up its products including its 216006 130 EQ reflector telescope.